A story about the most popular racing event in the galaxy, the Redline, and the various racers who compete in it. There aren't any spoilers in this review, but even if there were, the whole movie is on youtube cutesy of the creators. It's English dub, which is done really well, for a movie the dub really didn't even need to be good for. Wow is this movie an experience. OK first of what everyone is going to say, the visuals are amazing, maybe the best I've ever seen. They spent 7 years(7 YEARS) drawing this film. So it's worth watch once to look at. The other things that keeps you in this movie, besides the awesome racing scenes, the characters are entertaining, maybe more than the creators realized. JP is a kid at heart, and has high ambitions, a great protagonist for this movie. All the other characters are fun as well. The plot was not deep, but like it needed to be at all for a movie like this. I actually felt the movie focused to much on the roboworld plot(anyone else get a Nazi feeling from them?). It's like they were trying to emphasize how crazy the final race was going to be when I'm sitting here like "hey you have cool characters here let's develop them more." But none the less you don't need a crazy plot for this movie. Basically, if you enjoy anime, this movie is a must see. To everyone else, if you just want to completely lose yourself for an hour and half and go on a thrill ride, than buckle up and put on Redline. I saw this film in Adelaide as part of Madman Entertainment's 'Reel Anime' festival. 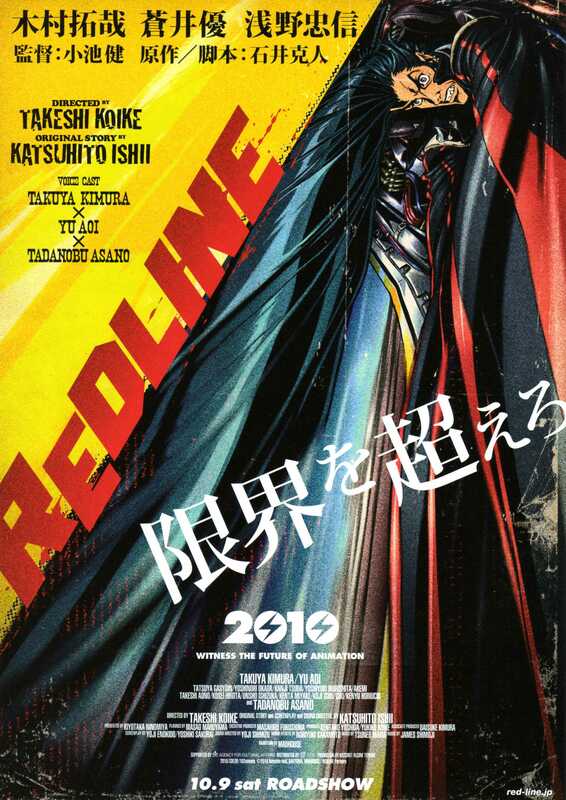 Redline is directed by Takeshi Koike, whom you'll know as long time Madhouse animator working under Yoshiaki Kawajiri on such legendary anime films as Ninja Scroll & Wicked City. So you know what to expect lookwise. Lots of dark shading & fluid, really well choreographed action movement. Redline is no exception! An absolutely incredible amount of effects animation on display here. Explosions & detailed mechanical carnage abound. Every shot of any character is just dripping with attitude too - very cool stuff. I won't say too much about the story other than to say it is a fairly straightforward racing tale. Follows the typical formula - racing, a bit of background stuff, then the BIG race... Fairly familiar in that regard, but the visual side of this film - the car designs, the architecture, the costumes - are really original & just plain cool! As I've said above, the animation is awesome & the shot choices are really dynamic & exciting to watch. A visual feast! Sit back & soak it up!